As a Youtuber, the camera is an all-time best friend. When you want to make good YouTube videos for your audience as a starter or an established YouTuber, you need to know what other top Vloggers are using in order to soar high in the same field as you. One of the greatest reasons is definitely the camera they use. A good camera can serve you well in terms of durability and performance and this will eventually give you undeniably higher returns. The following list will give you insight on the superior features of some of the cameras that famous YouTubers use and will allow you to take an important decision on the camera to consider. The data we have has been derived from what the YouTubers have told their viewers on YouTube. The Vloggers we have here are one of the most successful in the business having lots of their videos with millions of views. It is no wonder that this camera comes on top of the list. Its performance is incredible plus it is relatively small and lighter than other video recording cameras. Some of the features that the camera prides itself at are the 20.2 MP Autofocus, the 19 point cross-type with up to m7 fps shooting system, dual-pixel autofocus, it has most camera qualities that you would prefer including 720.1080 and HD. This is a less expensive camera that has most of its features comparable to the Canon 70D. it is a very user friendly camera with easy manual camera operations easily usable. You can also customize the camera to make it more of the way you want it for yourself. It has a very good LCD screen that is very easy to look at and operate. It also has good connectivity to the Wi-Fi and can integrate very well with android gadgets. It does not have an integrated on-camera feature where you can take a photo even as you record the video. Its NFC only integrates with android devices. The camera has an excellent camcorder with everything desirable for shooting a high quality video. With the XA10 you can make many adjustments to change aspect ratio, exposure, composition and the focus easily. The camera also works very well with external microphones and has a lot of storage space that allows you to store any kind of video in length. The downside f this camera is that all those additional features come at a price, not forgetting that it comes at a bulky size. You should take note of the options you want to consider when selecting this camera in terms of mobility. The camera will mostly need someone who is recording indoors. It has large storage of 64 BG. This is definitely for the big boys and girls in the vlogging industry. Its price is not one that many youtubers would want to hear when they are starting their youtuber carrier. In some circles especially in business and beauty, you need an excellent camera that will give you a picture perfects look. This camera is good for any environment and can take pictures while you are recording a video. It can also take a good landscape photo for your blog and adverts. The batteries are long lasting and can run almost the whole day while recording videos intensively. A lot of people in YouTube use this camera because of it 4K quality capabilities, plenty of options in controlling videos and its ability to endure any kind of weather. The major downside about this particular camera is that its not very good for YouTubers who upload videos indoors. The camera is mostly designed and its performance directed towards recording videos for outdoor activities such as sports, camping and other adventure activities. Voice features do not offer much usability. Professional YouTube vLoggers use professional DSLR cameras to shoot videos for their YouTube Channels. These high quality cameras produce HD quality and crisp video. DSLR cameras allow you to use different lenses prior to color, sharpness, zoom and focus needs. The best video cameras for YouTube produce the best video result. 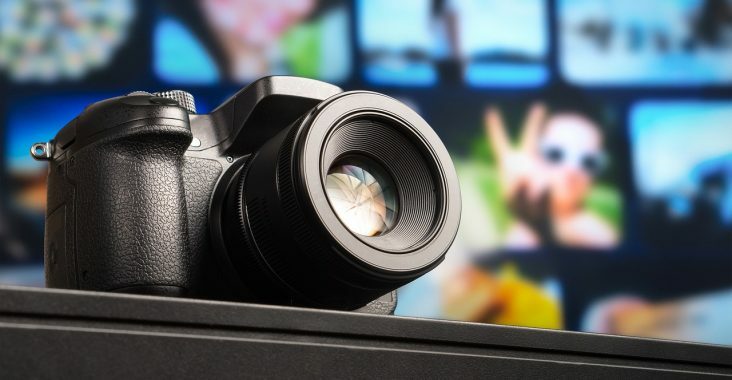 When deciding the video camera to use in recording your videos, there are many options that have proven good and dependable for many vloggers that you should choose from.